Aside from the built in fonts, JotForm also supports "@" at-rules e.g. @import and @font-face. You can use these codes to import your custom fonts from Google Fonts or fonts hosted on your server. A. Import fonts from Google Web Fonts to your form using the @import code provided by Google. 2. Go back to the Form Designer under CSS Tab and make sure to paste the import code ON TOP of all the existing CSS codes you may have. 3. To apply the imported fonts in your form, simply use the font-family property on .form-all class as seen on the above screenshot. You can also use the following code. Replacing Raleway with your Google Fonts name. Or you can go back to Google Fonts where you have copied your import code. 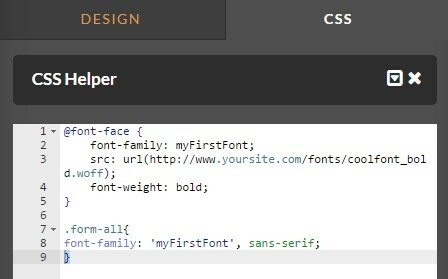 On step 4 Integrate CSS (see image below), you'll see the font-family property with the font name in it. You can copy it and paste it on the .form-all class. B. Use custom fonts hosted from your server using @font-face rule. 1. You can use the following sample code and paste it on the Form Designer under CSS tab. After that, replace the required values e.g. the font-family name and the source of the font. Or for browser compatibility, you can generate your @font-face codes using this tool https://www.web-font-generator.com/. If you have questions, post it below. I have attempted to inject our own font with @import and @font-face from our fonts.com web fonts project, with no avail. I'm wondering, has this option been removed? I cannot find the CSS tab, and found a different(Older) support post saying it has been removed. We would really like to use the Google fonts we have chosen for our website- is there another way to do this? I got this to work except for one thing. While designing the form everything is in your default font, looks like Helvetica. When I click on "preview form" it applies my font. This is good. But it would be better to design using the imported font. It's hard to design properly if not using the wanted font, particularly if the desired font is fixed-width (like Courier) but I have to design using variable width font. but my font isn't showing. What am i missing? How can I get this to also work for Safari? I want to use "Book Antiqua" how do I do this? My website uses Helvetica Neue Light, purchased and stored on my computer. Is there anyway to incorporate that into my form? I want to use devanagri hindi font in my web applicaition. When I type Sanjay it should show dropdownlist in Hindi. I will save this in sql database. Then again how to retrieve it from sql database and print on screen in hindi. How to do it? Pls help. Im not getting any help source. I've put this in as directed in Step 2 and my form isn't showing the font. Hi Guys, we have updated the guide. There should be no more browser compatibility issues using Google Fonts for as long as the browser supports @import code. Cheers! Can't get Ubuntu Light 300 to work. Any help??? I must be retarded because I cannot get this to work, any chance you all could a look at my code and see what the problem is? Also, is this supposed to appear in the drop down box as a selectable font or is it just suppposed to be there whenever I type? I'm really confused right now. I have managed to make the font the same for the entire form except the line of text I have added at the bottom of my form is there another tag I should add for that? Hi! I am having a problem making this work too -- here is the code I used. Any advice is very appreciated! I can not seem to implement the font Alegreya Sans SC. I do all the procedures you listed but the font is not added. where am I wrong? you could write the CSS text to be replaced? Hi, I would like to use "font awesome" but that is not available in Google fonts. Is there another way of doing it? Thank you. Also, I just realized that the heading's font did not change. I figured this out. Was doing something wrong. Same problem as birdwalkpress. At http://bookmoreweddings.com/marketing-to-brides/. I can't get this to work! 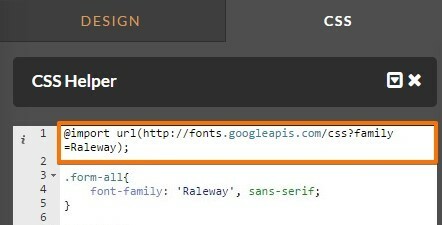 No errors, the code mirrors the above example, but I can't for the life of me get my Google Font to show as an option for Font in the Form Style page. What am I doing wrong? Thanks for this. It worked perfectly with Source Sans Pro. Will this work with fonts.com? Can I use Google Fonts in the email notification? How to configure Custom fonts on cards layout? Can you add the font Roboto? How to change whole form font to "brandon" font?